Membrane proteins make up between 20% and 30% of all expressed proteins and are medically important as they represent more than half of all present-day drug targets. Membrane proteins have hydrophobic exteriors, are relatively dynamic and are produced at relatively low levels. These factors create difficulties in obtaining stable preparations for NMR analyses. 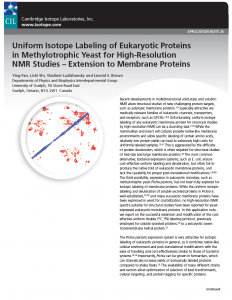 Despite the significant functional importance of membrane proteins, determining structures for these proteins is much more challenging than for globular proteins. As of January 2013, less than 0.1% of protein structures determined were membrane proteins despite being 20-30% of the total. Fortunately, there are many sample preparation conditions that can be chosen for solution and solid state NMR. Most preparations require a detergent or phospholipid for proper solubilisation and stability. Below is a link to the Structural Biomolecular NMR catalogue as well as a related application note that may be of use. If you have any questions about these products or wish to discuss your needs then please don’t hesitate to contact us.